Jakub Rudnik (left) and Brianna Kelly with their awards. 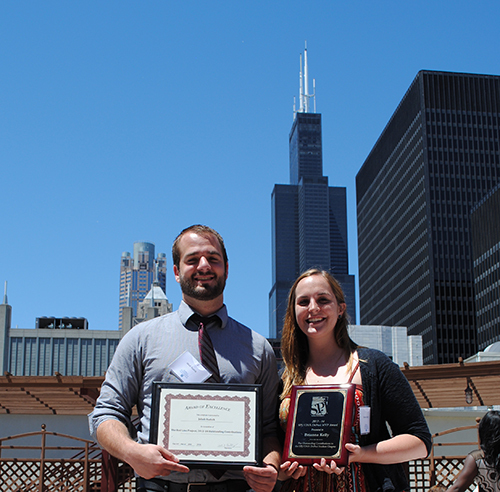 Former SPJ/ONA DePaul officers and graduate students Brianna Kelly and Jakub Rudnik picked up awards Friday at the DePaul University College of Communication awards ceremony on the Loop campus. Kelly, the outgoing SPJ/ONA DePaul president, received the organization’s Outstanding Leadership Award, dubbed the “SPJ MVP” award by the students. During her two years on the executive board, Kelly helped execute 15 programs and events, presented at the SPJ Region 5 conference and recruited nearly 60 students to join the organization. She served as secretary in 2012-13, when the chapter won the SPJ Outstanding Campus Chapter of the Year award. Rudnik won the Outstanding Multimedia Journalist Award for his work on The Red Line Project, a mobile site that covers news and urban issues near Chicago’s Red Line El stops. He contributed to national and regional award-winning projects, and helped relaunch Red Line as a mobile news site in fall 2013. As a graduate teaching assistant, he helped dozens of graduate and undergraduate students with multimedia projects. He served as vice president of SPJ/ONA DePaul this past academic year.